The Conservatory is open 10 a.m. to 5 p.m. daily, including all weekends and holidays. There are extended hours for some programs, please check the Programs and Events page for details. The National Garden is open 10 a.m. to 5 p.m. daily, including all weekends and holidays. 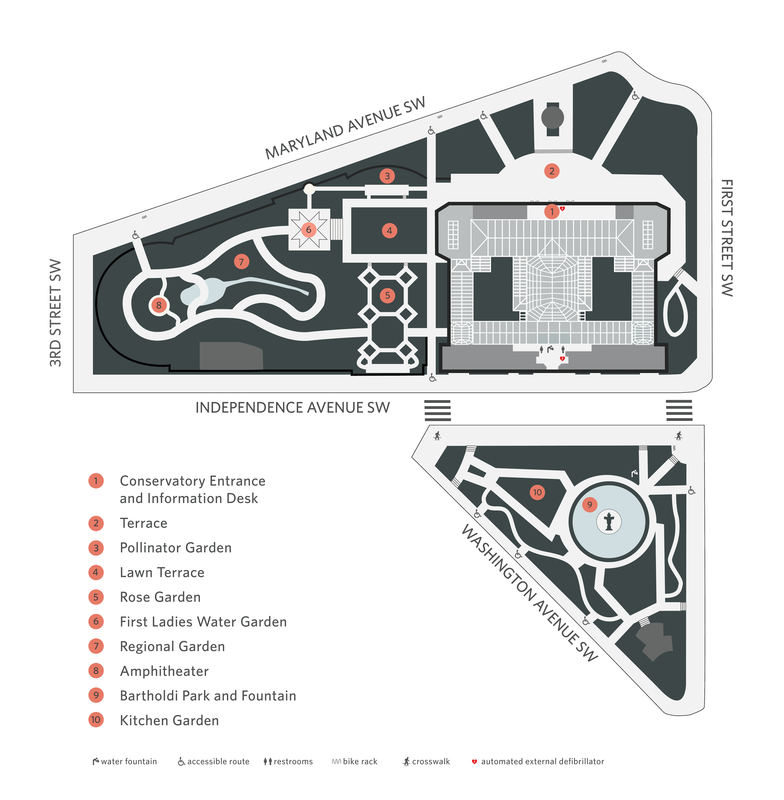 It is adjacent to the Conservatory, with entrances from Independence Avenue, from Maryland Avenue (at 3rd Street) and from the Conservatory Terrace. Bartholdi Park is open from dawn to dusk, daily, including all weekends and holidays. 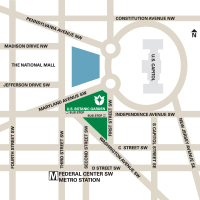 It is located across Independence Avenue from the Conservatory, with access from any of the three bordering streets - Independence Avenue, Washington Avenue or First Street. Admission to the U.S. Botanic Garden is FREE. The easiest way to reach us by Metrorail is by taking either the Orange, Blue, or Silver line to the Federal Center SW station. Exit the station, walk north (left) along Third Street SW for two blocks, cross Independence Avenue and continue one more block to Maryland Avenue. Look toward the Capitol and you will see the glass dome of the Conservatory. The Conservatory entrance is on Maryland Avenue. Metrobuses #32, 34 and 36 stop behind the Conservatory at Independence Avenue and First Street SW.
We encourage taking public transportation, you can plan your trip on Metro. 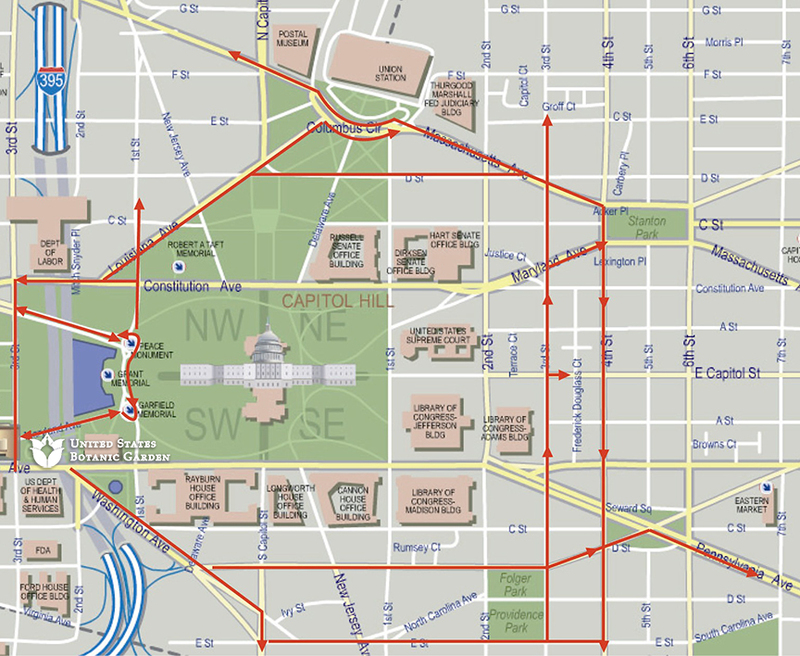 The National Mall route of the DC Circulator bus stops on 3rd St SW by the Capitol Reflecting Pool, in front of the Conservatory. 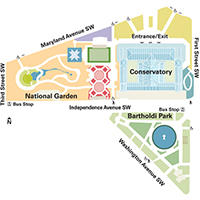 Metered street parking spaces are available within a few blocks of the U.S. Botanic Garden. A limited number of accessible spaces are available in front of the Conservatory on Maryland Avenue SW. There is no tour bus parking at the U.S. Botanic Garden. 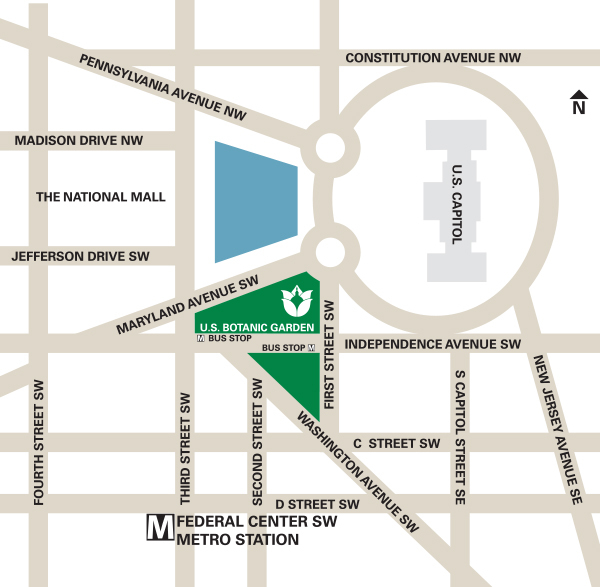 There is a tour bus route from the Capitol to Parking Lot B at Union Station. Tour bus drivers should use this route between the tour drop-off/pick-up point on First Street SW and the bus parking lot.